Royal Armouries MS I.33 is the oldest surviving martial arts book in the world, and the facsimile from 2003 is long out of print. Jeffrey Forgeng, a curator in New England, was one of the first academics to look closely at this manuscript as both a book historian and a fencer. I have never been able to read one of his books (because the historical fencing movement grows so fast, they go out of print quickly) and I am glad to have a chance to read this one. He does not try to reconstruct the lost pages using these related manuscripts in his facsimile, just notes the beginnings of the quires and the locations of the half-leaves in the margins of the translation. In the section which follows he suggests that martial arts books are more about asserting your membership in a community than improving your practice, and the beautiful ‘cutaway’ dust jacket, with fragile tabs of cardboard outlining a cross, suggests that the book designers envisioned this as a book which will stay in tidy libraries not dusty kit bags. So do the blurbs on the back of the dust jacket, which are by distinguished scholars (some of whom get walloped in the head with an axe every summer) rather than famous fencers (some of whom engage in serious historical research). Jeffrey Forgeng has published more and better books than most academics publish in a lifetime, while losing his workplace and his spouse. He has done enough. I strongly agree that editions of texts and how-to books are different things, with different life cycles and audiences. At the same time, it is a bit disappointing that he segregates his academic project from what he does in the salle. This book is available in hardcover and possibly paperback on biblio. If you want to see more reviews like this, please support this site. Roland Warzecha, the Dimicator, has a long term project on martial arts before manuals: reconstructing sword and shield combat from the Viking age to the early 14th century. He uses martial arts principles, surviving artefacts, artwork, and parallels with surviving fencing manuals which teach shield fighting. Academics often lump projects like this with experimental or experiential archaeology, and have learned tomes debating the theory. But there are advantages for people outside the university working on this: universities often have cumbersome human subject research bureaucracies, and academics rarely have the time to devote themselves to martial arts like other kinds of people do. So since the 2000s, the historical fencing world has included people who experiment with historical weapons alongside people who focus on fencing manuals and people who are trying to keep obscure martial arts alive. This summer he has the following events scheduled in Germany and Denmark where people will attend in period clothing and train for two days at archaeological parks. You can find more information on his Patreon. Elsewhere I have said the good things which need to be said about his project. Here I just want to point out that he sees historical fencing as part of a broader project to understand the Viking Age and the high middle ages. He wants to understand how swords were worn, not just how they were shaped; the people he studies did not use fencing masks or thick padding (padded armour first appears in western Europe in the 12th century CE), so he tries different ways of training which don’t require either. Because of this holistic approach, it is very easy for him to work with archaeologists, museum staff, and the proprietors of archaeological parks. People who reconstruct historical artefacts take it for granted that nothing they make is authentic. But as long as they understand that, and allow for it, it can still be useful and educational. If they are patient and keep studying and criticizing and practicing, their reproductions get closer to the originals. The experiments by Dimicator and his colleagues in other countries have showed that Viking Age swords and shields are much nimbler than we expected, and that they can do things some people did not think possible. Seeing that wide range of possibilities is valuable, and so is spending time trying out different approaches. He is already publishing swords, shields, and scabbards in museum back rooms, and plans to publish a book with both arms and armour scholarship and fencing interpretations. If you are really interested in clothing, or Viking Age leather goods, not fencing, you can still get something out of his project (and maybe you will catch the fencing bug too). People have been trying to imagine how Viking chiefs or Bronze Age warriors fought since at least the 19th century. They are not going to stop any time soon. If people are going to guess, isn’t it better that they draw on archaeological reports and martial arts experts than whatever pops into their head? A few years ago, I published a short magazine article on how martial arts best practices let you learn more from playing around with spear and Argive shield. But so far, this movement is smaller than either the movements which dress up in reinforced Vikingish kit and bash each other, or the movements who dress in black sportswear and organize longsword tournaments. So far we have one project which positions itself in the text-based humanities, and another project which keeps one foot in archaeology and the other in martial arts. The last plants its flag on a different position. My most satisfying and productive adversarial collaboration was with Gary Klein, the intellectual leader of an association of scholars and practitioners who do not like the kind of work I do. … I invited him to join in an effort to map the boundary that separates the marvels of intuition from its flaws … Over seven or eight years, we had many discussions, resolved many disagreements, almost blew up more than once, wrote many drafts, became friends, and eventually published a joint article with a title that tells the story: ‘Conditions of Intuitive Expertise: A Failure to Disagree.’ Indeed, we did not encounter many issues on which we disagreed- but we did not really agree. Guy Windsor is just as experienced and respected a teacher and interpreter of historical martial arts as Jeffrey Forgeng is a translator and historian. It is always thought provoking to see how an expert introduces people to their field, what topics they chose to cover, where they refer people for further information and who they pointedly ignore. Guy imagines a reader with no prior knowledge or experience or contacts and prepares them “to become an expert in historical martial arts.” He understands this as a martial arts problem, where physical training, emotional preparation, and reading fencing manuals (“lots of fencing manuals!”) is essential and skills from the humanities, or a broad interest in the world which produced those manuals, are nice but unimportant. As a martial arts book, a book on teaching and learning any skill which involves moving under pressure, this book is excellent. This book begins and ends with poems of praise for historical fencing, its ability to transform lives and the wonderful, passionate, bumbling, inspired, human people who engage in it. Guy takes time to address the common reasons why someone who wants to take up the sword might not have given him- or herself permission. Just being able to buy photographs and translations of pre-18th-century fencing manuals puts anyone starting today a decade ahead of the founders! (And the groups which rush out to buy expensive uniforms, line up in rows, and organize tournaments don’t necessarily fence very well, even if they look serious and organized). I especially admire this book’s openness to people of all ages, disabilities, levels of fitness, and other kinds of brokenness. As Guy has said elsewhere, none of us has to fight a duel to the death tomorrow, so it doesn’t matter whether we are good enough just that we keep improving and getting something out of what we are doing. I strongly agree that one of the problems with focusing on competitions is that it selects for students who are young, fit, and like moving, ones who would be doing something athletic if they never joined a rapier fencing club, but martial arts can often get the couch-bound to take up an active life. Guy is open to a wide range of sources of wisdom without being credulous: the book brims with advice on how to live a better life, but repeatedly cites sources or suggests that you try different things and see what works for you. It has thoughtful, original remarks on many of the things historical fencers love to argue about, including the value of sports science, the black plastic “Mad Max gear” which some of the newer groups wear, and the strengths and weaknesses of tournaments. If you have trouble moving in cutting practice or sparring like you move in drills, this book has advice on how to bridge them; if you never taught a sport before, this book is full of tips from an experienced and trained teacher. Guy is also passionately concerned for students’ well-being. Although nobody could question his devotion to understanding how they did it back in the day, he suggests that if you think a historical technique will cause chronic injury over time (eg. some styles of lunge), you should modify it after advice from experts. He wants students to make martial arts a life-long hobby, not to train intensely for a few years until they suffer a serious accident and have to retire. The section on ethics is another side of this: in his view, learning to stab someone in the face comes with the responsibility to think hard about when that is acceptable. As a martial arts book, or a recruitment ad for a more active life, this book is magnificent, original, and thought-provoking. It is carefully designed and edited, and I noticed only one small factual error. But it is not just a martial arts book. In clear martial prose Guy defines his task as follows. Given this definition, it is a bit unexpected that the section on sources and their interpretation is only 10% of the book, about as many pages as are given to equipment (mostly swords) and to breathing (theory and practical exercises). That section is original and effective (I especially liked the advice on how to compare translations if you cannot yet read the original), but it is still only 30 pages. the art of memory, the practical use of numerology in composing and remembering, why didactic texts are often in verse, etc. About half of these topics are touched on in the book, but in sections on something else, and there are rarely pointers to books and websites where people who never heard of these things can learn more. In contrast, every piece of advice on diet, learning, and the good life ends with “and here is a book you should read about this.” The unspoken lesson is that students have nothing important to gain from learning about the middle ages, but they have something very important to learn from reading fencing manuals and pop science books. This is a book which urges readers to seek out experts such as the British Academy of Fencing for more information. Great collectors like Richard Wallace, Frederick Stibbert, and R. Ewart Oakeshott are also acknowledged. But it does not suggest taking an evening class on “Germany in the Age of the Reformation” or “Clerks Behaving Badly: Order and Disorder in High Medieval Europe,” or talking to a reference librarian about background reading. This is a deeply philosophical book, with advice on epistemology (“how do we know what is true?”) and the good life on the first few pages and a whole section on ethics. But it does not recommend that students read philosophers, whether ancients with swords like Xenophon and Marcus Aurelius, or desk-bound moderns like Dan Dennet and Massimo Pigliucci. Instead, it urges readers to read Israeli and American psychologists like Daniel Gilbert and Daniel Kahneman. It mentions Aristotle’s physics, but points out that the best way to learn how fencers used it is to read Angelo Viggiani’s fencing manual from 1575. Quite a few people who do violence for a living find the Stoics helpful, but this book does not mention they exist. It does quote the Kalama Sutta and Wolfram von Eschenbach’s Parzifal, but as examples of sources which his readers draw on to answer his ethical questions. In short, this is a book on a deeply humane topic, by a writer with a MA and a PhD in the humanities, which takes the position that philosophers, historians, philologists and archaeologists no longer have anything essential to offer historical fencers, beyond providing the manuals and swords which they study. This is a book by a student of literature which takes the position that if one trains hard and reads and re-reads the sacred texts, all will be revealed in time. I see myself as a builder of bridges between my kind of academic and other communities interested in the past. I put my deeds behind those words. But can my gentle readers understand why I look at the gulf between my position, and this book’s position, and I am not sure if all the ships in Xerxes’ fleet could bridge it? Let me be clear: I am not sticking my nose in the air because I know something that someone else does not. I am pretty sure that Guy knows more about this than I do, and I agree with XKCD #1053 and Epicurus on this one: there is no shame in not knowing something, as long as you are willing to learn! Not many people got to study book culture with Erik Kwakkel or prosopography with Waldemar Heckel like I did, and not everyone lives next to a university library. Back in 2013 I wrote a scholarly article on medieval book culture for historical fencers. What upsets me is that because this knowledge is so rare and so hard to learn, someone who knows where to find it is deliberately hiding it from students! Guy has written about these things in the past, so I have to conclude that he thinks students no longer need to learn them directly from academic experts, a quick summary is more than enough for the purpose of interpreting fencing manuals. I agree that the process of interpreting historical martial arts has to be a physical process drawing on the expertise of martial artists, kinesiologists, and so on. But I do not agree that the most important things the humanities offer to fencers are language lessons and a better understanding of 18th century prize fights or 16th century duels! Also, relationships require work by both sides (I can’t cite a psychologist who passes on this particular bit of wisdom, but I am pretty sure that the ‘Conflict Communication’ experts like Marc MacYoung mention it). Historical fencers sometimes feel hard done by because few academics know and respect their work. But look at it from the academic’s perspective. How do they feel when confronted with a student who wants to study fencing manuals and only fencing manuals? How would the fencer react to a student who wanted to skip all the footwork and stance practice and wrestling and move straight to fighting with spears? If fencers are not interested in what historians do or how they think, why in Cleo’s name should a historian put in hours of hard work to help them? 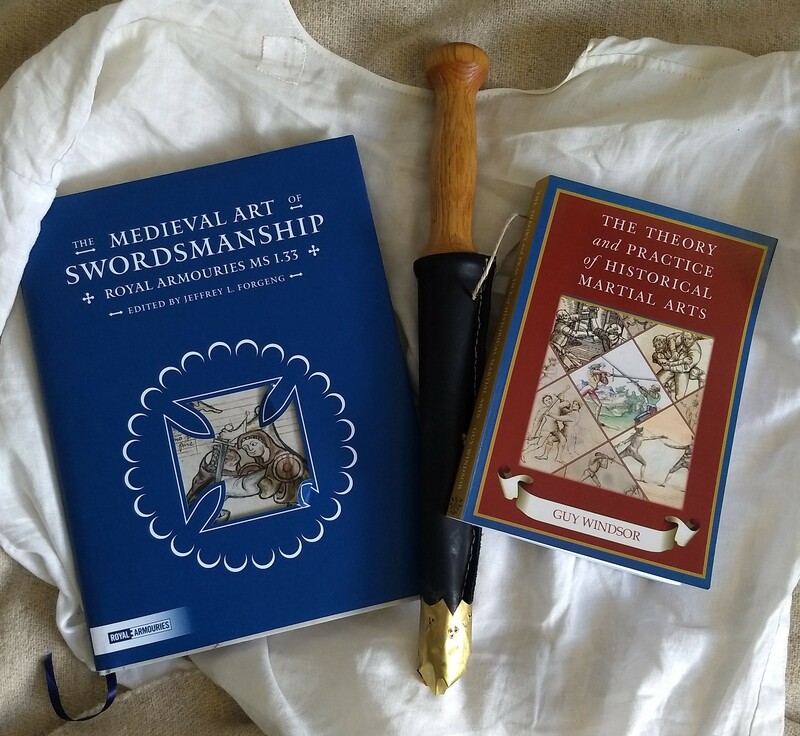 I think it is my duty to try to share things my kind of academic knows with a wider audience, but when I decide what to share I am aware that hardly anyone seems interested in what I say about martial arts, but lots of people are very happy when I write about swords or clothing or armour. To this academic, that is a good reason to write more about swords or clothing or armour, and less about fencing. The ideal reader of this book is someone who already has a solid humanities background but was never part of an organized program of physical training, but the book does not offer hooks for students like that. Its answers to “why learn fencing?” focus on self-perfection, fitness, and the awesomeness of swords (and swords are awesome!) Those are fine answers, but they are not framed to appeal to the kind of people who are in a living-history group, have a BA in history, or just read a lot of Osprey books. My gentle readers have noticed that history books often contain sections which talk about how arms and armour are connected to the history of technology, or how you have to understand the Roman army to understand Roman society. These serve two functions: they show that the author has done the work to learn about these other things (so maybe people interested in them should reciprocate by learning about the author’s topic) and they give people who are mostly interested in those other things reasons to read a book on something else. This book does not even try to make a case that someone interested in history would benefit from practical knowledge of fencing. On the other hand, students without that academic background are given no encouragement to seek it out, no vision of what it might look like or instructions on how to acquire it. There are affordable, readable books on medieval manuscripts or historical methods! But from my point of view, assuming that students ‘just know’ where to find these books, or that ‘the people who are serious will seek them out,’ is just as misguided as assuming that all students know how to fall safely. This book argues that “modern Japan probably has more in common with modern Manhattan than modern Manhattan does with medieval Milan” (p. 39) but it suggests that readers cross that divide by studying traditional fencing theory and then reading fencing manual after fencing manual with sword in hand, not by studying historical cultures as an organic whole. In short, this book argues that the skills of professionals in understanding historical cultures- of linguists, historians, archaeologists, and philosophers- are irrelevant to historical fencing. Instead, it envisions historical fencing as its own thing, without any essential connection to the study of other aspects of past culture. That makes me more than a little bit uncomfortable, because as the author says martial arts are at least as much shaped by arbitrary cultural whims as by fixed physical and biological laws (p. 38). 20th century European martial arts books have a lot more to say about punching than 15th century martial arts books because one culture decided trading punches was cool and the other decided that it was not. This book states that the Nürnberg Hausbuch is “definitively” dated to 1389, but the manuscript experts I have read are not so sure. But this is a brilliant martial arts book, a book on teaching and learning any skill of moving under stress, and I hope that people who already know how to interpret sources in their cultural context, but not how to move, see that they can get something of value from it. A book which inspires people to get out of their chairs and do something vigorous with their friends will do more good than the kind of book I write. And maybe, somewhere, there is someone with a shiny new sword and a fencing mask who is reading this, asking themself “what is an affair of honour?” or “why is a lynx keen-eyed?” and headed to the local public library to borrow some books. This book is from a small press, so if you want to buy it, try the links on the author’s website. If you own the author’s other books, keep in mind that parts of this book are very closely based on them (eg. pp. 186-187 on whether to focus on good technique or winning when sparring sound very much like my memory of The Swordsman’s Companion (2004), although I do not have my copy of that book with me in Austria to check). I received a free copy to review and I know (have met?) the author. If you want to see more reviews like this, please support this site. Today some in the historical fencing world are retreating from practice and interpretation and writing pure academic studies which barely hint that they kit up and shield-strike their way around the nearest park, and others are retreating from history lovers and framing their writing as martial arts projects for martial artists. A few in the middle are trying to hold both sides together, but they are few and if the larger factions on either side keep pulling in opposite directions, one day they will fail. Of my thoughtful friends who were so excited about historical fencing in 2009, most have either withdrawn to their own schools, or put down the sword and taken up the clay cook-pot, the armour scholar’s sketchbook, or the triathlete’s running shoes. These days I rarely visit that world, although it has many things to offer the traveller. If any of my gentle readers are still part of it, please: ask yourselves whether you are building bridges or walls. Edit 2019-04-15: Added a note about the incorporation of material from earlier books in The Theory and Practice of Historical Martial Arts.